You will earn 11,176 Reward Points. Earn 1 reward point for every 1 dollar spent. Kettle will be constructed of welded satin finish, stainless steel type 304. A double wall kettle interior will form a steam jacket around the lower 2/3 of the kettle. The jacket will enclose heat elements (Which will be easily removable for service), water and antifreeze design for superior heat distribution. Unit will be mounted on a stainless steel pedestal base. Pedestal base will have four holes evenly spaced for securing the unit to the floor. Controls will be integrally mounted to the kettle base and will include a power switch, thermostat, pilot light, vacuum/pressure gauge, safety valve, and low water shut-off. 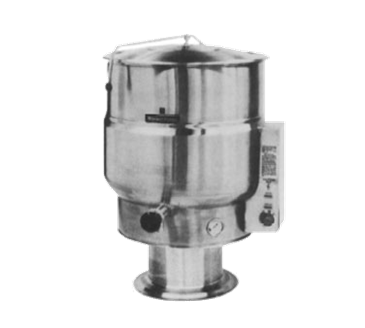 Kettle will operate in a temperature range of 140° to 290°F (60° to 144°C) at a maximum pressure of 50 PSI (3.5kg/cm2). Convenience feature will include a counterbalanced hinged stainless steel cover and a 2” (50mm) sanitary draw-off valve with strainer and heat resistant handle. Single pantry faucet with swing spout and mounting bracket.